I love holiday food, and sometimes it’s nice to share foods that might be new to the seasonal menu. Brussels Sprouts might make it to your table, but most people roast them. 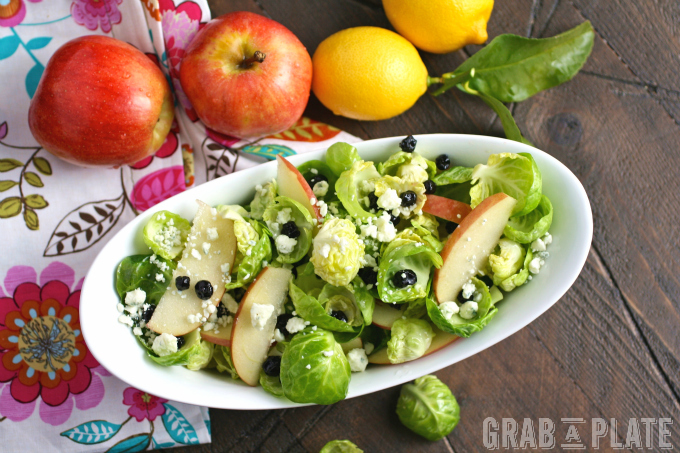 This Brussels Sprouts Salad with Apples, Blueberries & Lemon Vinaigrette will do you right for something a little different. It’s bright and crunchy and filling! Brussels sprouts salad for the win! The colors in this salad are beautiful, and depending on where you live, you can pick the lemons to make the vinaigrette from a nearby tree. I know I’m spoiled with citrus trees in my backyard, but I never take them for granted. I try to use them as much as possible when they’re in season. Whether you pick the lemons for this salad and its dressing from a tree or from a grocer’s bin, you can’t beat homemade salad dressing. It takes next to no time to make with just a few ingredients, and the flavor is so bright and refreshing. 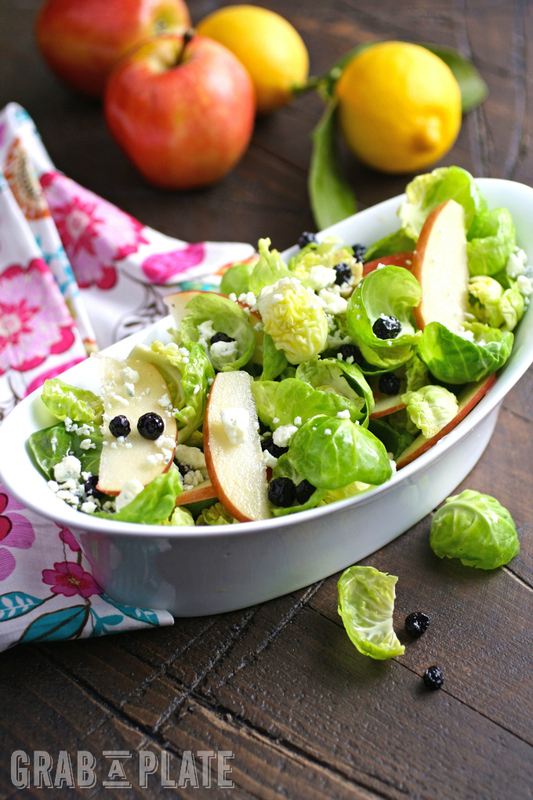 Pair Brussels sprouts leaves with sweet, crispy apple slices, dried blueberries, and a bit of salty blue cheese for a flavorful salad. You’ll love the combo, and if you’d like, toss in some toasted pecans. You can also swap dried cranberries for the blueberries, and grated Parmesan for the blue cheese. Easy! This seasonal salad is both flavorful and filling! The homemade lemon vinaigrette is easy to make with just a few ingredients and adds brightness to this pretty salad. Add the /4 teaspoon salt over the minced garlic on a cutting board. Use the flat side of a knife blade to mix and mash the two together until a paste forms. Add the lemon juice, zest, garlic, mustard, sugar, and about 1/8 teaspoon each of salt and black pepper to a bowl. Whisk to combine. Add the olive oil to the bowl, a little at a time, whisking. Stir the dressing before using. 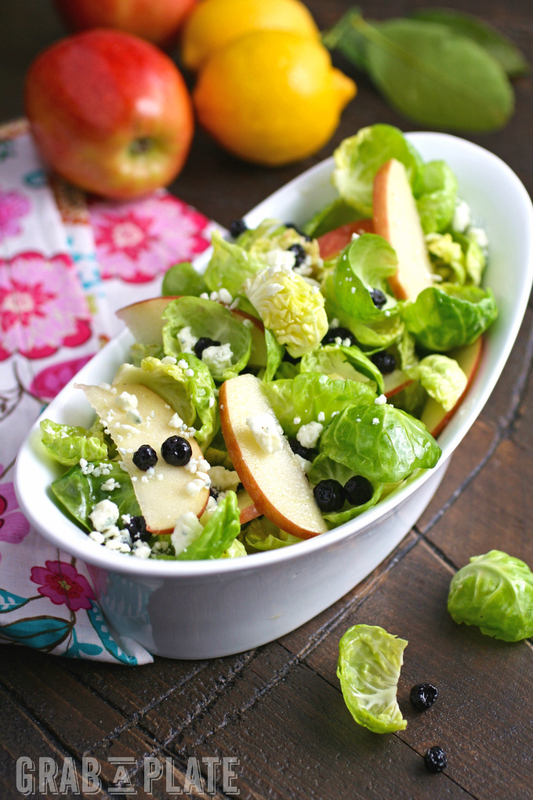 Combine the Brussels sprouts leaves, apple, and blueberries in a large bowl. Drizzle some of the lemon vinaigrette over the salad and toss to combine. Transfer to a serving bowl and sprinkle the blue cheese in. Serve in individual bowls with extra blue cheese and lemon vinaigrette on the side. This is a filling, seasonal salad! If you'd like, swap the dried blueberries for dried cranberries, add some toasted pecans, or use Parmesan cheese instead of blue cheese. This is a great salad for lunch or dinner! I love this salad and the way you separated the leaves to make it. I have to try that! My mom just gave me kalettes last night and I think I may try them this way! BTW, I'm totally jealous of your local lemons! This looks amazing! Love the addition of blueberries. Thanks, Florian! I have really just started using dried blueberries in more things. Love them! This looks awesome! I am pinning to my salad love board! you know it's been a good holiday when even the kid are requesting salad for dinner :) we ate our way around NY and now this salad looks like the best and most delicious way to get back on track! Haha! I know...I can only take so much! I still have one holiday visitor here with me, but we're trying to lighten things up! Thanks, Heather! 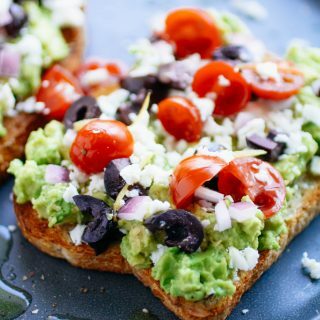 I am totally making this for lunch! Ooo! Let me know what you think! Thanks, Angela! This salad looks so refreshing - love the presentation in that big bowl too! Thanks for your kind words, Beth! What a deliciously healthy salad! I love Brussels Sprouts and I think if I presented them this way, more of my guests would love them too. Right now they only love them roasted with lots of bacon! Haha! I love roasted Brussels sprouts with bacon, too :) Thanks so much - hope you give this version a try! There is just no part of this recipe I don't love! I can't wait to make it. This salad sounds wonderful! The vinaigrette sounds like it can go with a lot! Thanks, Leah! Yes! The vinaigrette is great with so much! This sounds SO refreshing! I'm in desperate need of new salads in my rotation, too - can't wait to try this! Thanks, Chrisy! I know...Ive been searching for some new ones, too! Thanks so much for your kind words, Ginger! Mmm this salad looks great! Thank you for sharing! Um, is it wrong that I am eating a freshly baked cookie while reading this? Oopsie! :) This salad looks SO refreshing after the holidays, though. I absolutely love how you used the brussells sprouts. I only started eating and cooking with brussels sprouts about 5 or 6 years ago, and I have always cooked them. I haven't had a salad with uncooked brussels sprouts and will have to give this recipe a try! It's definitely not wrong -- I've been eyeballing leftover cookies all day, but so far, so good! Ha! Thank so much, Marlynn! Happy new year, Patricia! I roast brussels sprouts all the time, but I've never thought of adding them to a salad! This looks beautiful! Hi Lisa! Thanks and Happy 2016! I love roasted Brussels sprouts, too! Hope you give this a try! What a neat way to use brussel sprouts! Can't wait to try this one:) Trying to be more healthy this January! You & me both, Terumi! Thanks so much! So light and refreshing, I love Brussels sprouts and all the flavors you've combined here! 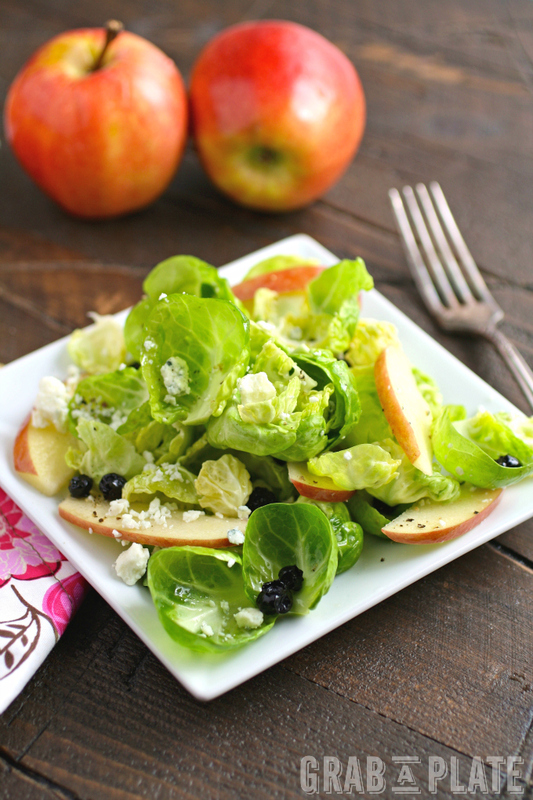 I love the idea of having brussels sprouts as a salad with apples - sweet, tart and delicious! Hi Erin -- thanks so much (and crunchy, too)! This looks like a winning combination to me. I must try it! Thank you, Maria! Hope you try & enjoy! What a gorgeous salad! The dressing sounds fabulous. Thanks, Michelle! The dressing is super fresh & easy to make! What a delicious salad to help get back on track - love the mix of greens and fruit! I am so jealous you can pick your own lemons!! My husband and I bought an apple tree this fall...it is our first fruit tree (although from what I understand we need another in the yard to get fruit, so I guess we'll be adding another this spring). Anyway, your salad looks fabulous...I've been meaning to try brussels sprouts in a salad! Thanks for the recipe! Thanks, Michelle! I'd be thrilled with any sort of fruit in my yard, especially apples! You'll be thrilled once you get them! Let me know what you think if you try this salad! I typically do roasted brussels sprouts but I love the idea of putting them in a salad! I'm going to try this next time I buy some! Hi Sara! I love them roasted, too! 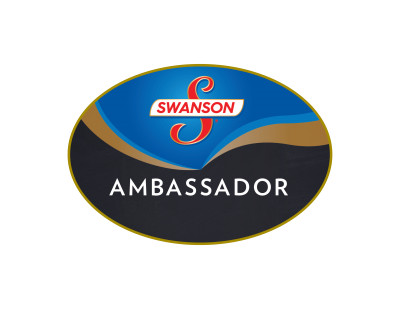 Let me know what you think if you try them in a salad! Hi Katy - glad you found this! Hope you enjoy it! Thank you! Lovely winter salad! I've never had brussel sprouts fresh -- usually I roast or microwave them. I'll pin this on my board. 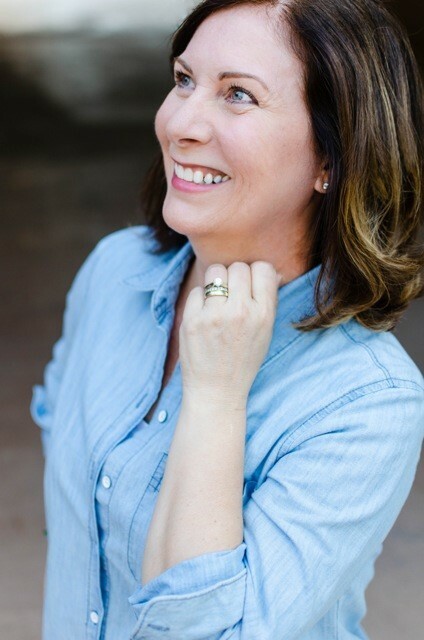 Hi Julie - thanks so much! I looooove them roasted, too! This looks like freshness itself on a plate! I'll admit that I am not a huge brussel sprout fan, but when prepped in raw form, I'm much more likely to enjoy it. And what's not to enjoy with the ingredients you've put together here?? Yum! Thanks, Dee Dee! I hope you give this a try and enjoy! 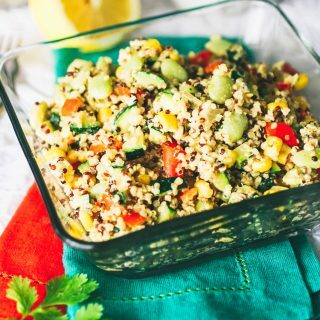 This salad is lovely and a perfect transition from holiday food to healthy food!! I'm pretty new to brussels sprouts and I am loving them in salads! That's great, Jenny! They are so yummy (I like them roasted, too)! Thank you! Ooooo Brussels are totally my jam! And this recipe is an entirely different way to eat them than I'm used to. LOVE IT! Thanks for the inspiration! So glad to hear! Thanks for stopping by, Chrissa - hope you try this and enjoy it! I'm not a huge fan of Brussels sprouts put I'd probably eat this! Love the flavors. Thanks, Matt! People seems split 50-50 over Brussels sprouts, but maybe this recipe can help sway some people, like you said! Haha, salad me please :) it can be a rude transition from the holiday cookies back to the freshies but with a plate as attractive as this, you make it easy & desirable! Love all the goodness you've packed into this salad Patricia and your vinaigrette sounds delightful - lemon/apple/blue cheese...mmm. Wishing you good things in 2016, x. Thanks so much, Kelly! It *is* rough!! You know I love my lemon tree out back ; Happy 2016!! I have never considered adding Brussels sprouts to a salad. Just saw the other day fresh ones in the shop. I think so it's a sign that I should try your salad some time. The colors are so fitting for the season, it's inspiring. Thanks so much, Helene! I think it's a good sign, too :) Hope you try this and enjoy! WoW! This looks amazing and so fresh! Thanks for sharing! I love brussel sprouts and this looks so good! What a divine recipe!! We have so many sprouts in the garden, and I've just been roasting the heck out of them. This gives me something new to try. Oh, how lucky you are! I love Brussels sprouts roasted, too, for sure! Hope you try this! Thanks! Love this idea!! The salad sounds so good! I am going to try it this week. I eat salads for linch and have been looking for more simple and fun salads. This is simple & so good! Hope you love it! Thanks, Anika! I don't think I have ever seen a recipe that uses raw Brussels! Well done. This looks delicious. I've never thought to use brussels sprouts as the base of a salad. This is such a good and nutritious idea! So much yum! Thanks, Christine! Hope you try it soon! I know -- me, too! Thanks, Krista! 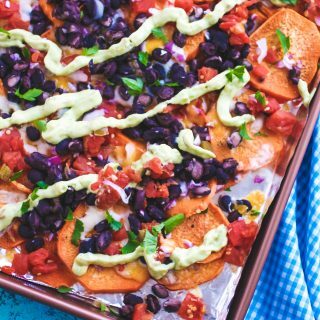 This recipe is so easy to put together and really healthy too -- I love it! Thanks so much! Very easy! Thanks, Savannah! Hope you enjoy this dish! Looks so light and refreshing. A perfect break from the heavy meals that are popular this time of year. Yes! Sometimes you just need a salad! Thanks, Erin! I love the addition of the dried blueberries in this! Changing things up a bit since I'm kind of over the dried cranberries ! I have everything to make this so I know for sure what Im going to have for lunch! Totally agree, Michele! Dried cranberries are good, but nice to switch it up, too! Thanks & enjoy! So many wonderful flavors in this salad! Looks amazing.